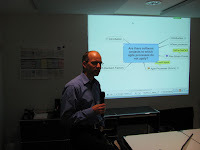 Last Wednesday, Dani Tobler of Zühlke gave his take on the virtues of agile and non-agile (i.e. RUP) approaches to product management. Dani brings his experience developing embedded software and teaching students at a "Fachhochschule" (Technical University) to the table. Applications for which electronics, mechanics and software all play are role. Incremental releases and feature driven development seem less natural to the world of embedded systems. An interesting analogy: Project planning compared to mountain climbing. If you are trying to climb Mount Everest, you plan, staff and budget quite differently than if you are planning family trip to nearest park (in our case, the Uetliberg). So the approach to large SW Project might/could/should be different than for small projects. All of the developers are really junior and need to guidance on what to do. This case applies particularly to a university context in which students are just learning the tools of the trade. Agility brings discipline and effective communication into the development process. RUP offers proven practices (e.g. the development phases, risk first development strategy which do have value. The discussion afterward was as usual spirited and interesting, including a discussion of complex vs. complicated systems (which I will attach the German language correspondence in a comment). Das heutige Scrum-Frühstück war - wiederum - sehr spannend! Danke für euren Einsatz! Selbstorganisation bei Komplexität: Vom Mut, es NICHT verstehen zu wollen. System-Thinking and SF In diesem Posting braucht nur "solution focus" durch "agility" ersetzt zu werden... und dann passt es auch zur Frage, wann Agility (IMHO) angemessen ist. Complexity-Based Agile Enterprises: Putting Self-Organizing Emergence to Work Dieser Artikel zeigt sehr schön den Zusammenhang zwischen agilem Vorgehen und "Complex Adaptive Systems". Hello, Why would the second case you describe (the all juniors project) not be suitable for Scrum? In my opinion, having only juniors will indeed be different from having a 'normal' team with mixed profiles. Getting the all junior team to become self-organizing and cross-functional can be harder. But using Scrum might even benefit that team, because it helps the juniors to set small, reachable goals for every sprint and Scrum will definately give them quick feedback on their progress. So, I would even recommend Scrum to such a team, to make sure they inspect and adapt every few weeks. Just my two cents. Let me know if I miss something here. Disclaimer: I have not worked with students, so I am just the messenger. I hope Dani will chime in on this. The issue was that Scrum doesn't actually tell you how to do anything. It tells you to self organize and assures that communication works. But if you have really no idea on where to begin, Scrum won't help you. I remember thinking, as I read through the RUP book for the first time, "this would be really useful for a 2nd or 3rd year C.S. student, as he learns how to do SW Development." Good foundation, but the stuff you internalize and just do, not the stuff you refer to on a daily basis. So Dani's statement was something of a confirmation of that impression. I saw in an other context (unfortunately I don't remember where) the observation that XP did not work well in a teaching environment. Hmm. More confirmation. It would be interesting to do some research: is this a coincidence or a trend? If you only have juniors in the project, you have to do anything independant on the chosen process anyway. You need at least one experienced developer to shows the juniors the importance of other things than coding (configuration management, customer collaboration, architecture, management satisfaction, ...). RUP gives here an excellent guidance in form of its phases and disciplines. But the point I highlighted at my speech was about students: I have seen many master theses (6 months duration). They worked fine with RUP (very, very light weighted) but not with an agile approach. Why? : There was not enough time to establish an agile discipline beside all the technical challenges. Peter, could you please correct this topic in your blog? I have successfully used Feature Driven Development with embedded systems involving electrical and mechanical components. The key was to decouple the software from the hardware by constructing software simulators that simulated the behavior of the electrical and mechanical components.